Due to the number and intensity of wildfires that occurred in southwestern Colorado in 2002, specifically in the San Juan National Forest, morel mushrooms were expected to grow in record numbers in 2003. Forest managers anticipated a large influx of morel hunters in search of the prized mushroom. In order to monitor the morel mushroom harvest, permits were required for collection. A small-scale study was also conducted by Forest Service personnel on the abundance of morels and the success of mushroom hunters. The San Juan National Forest is located in southwestern Colorado, and is divided into three ranger districts: Pagosa, Columbine, and Dolores. The largest of the 2002 wildfires within the forest occurred in the Columbine Ranger District--the Missionary Ridge Fire. This fire burned approximately 70,000 acres throughout several vegetation types, including mixed conifer, ponderosa pine, spruce-fir, and aspen. The fire varied in intensity throughout the burn area. For the purpose of this study, all vegetation types were searched, although an emphasis was put on mixed conifer and pure aspen stands. A selective search of nine areas within several vegetation types was conducted by Forest Service personnel on June 10 and 11, 2003. Several of these sites were revisited on June 26, 2003. Search areas were chosen by vegetation type and burn intensity. Most of the search areas were located east of Vallecito Reservoir, one was conducted west of Vallecito Reservoir, and one search was conducted west of Lemon Reservoir, along the Young’s Canyon Trail (Figure 1). Searches were conducted by hiking within the selected areas and seeking out areas of moderate to high intensity ground fires within ponderosa pine and aspen forests. Areas of concentration also included intense ground burns underneath downed ponderosa pine and aspen logs. Evidence of morel gathering was also looked for within these areas. Previous gathering is often indicated by “cuttings,” which are the remaining morel stems left after the cap has been removed, usually by a knife. Information on morel occurrence was also gathered from other forest service crews working in the area and familiar with the identification of the mushroom. Seven areas varying in size, vegetative component, and burn intensity were searched for morel mushrooms east of Vallecito Reservoir (Figure 1) on June 10, 2003. These areas are all accessible from FR 602 and FR 603. Morel mushrooms were found in two of the search areas. The largest patch of morels in this area was found in Gut Canyon, where they were growing in a mixed conifer stand that had experienced low to moderate burn intensity. The slope of the area was approximately 30 percent, while the aspect was east-northeast. Elevation was approximately 8,000 feet. The morels were found at the base of a burnt ponderosa pine stump and burnt aspen log, where the ground litter had been completely consumed in the immediate area (Figure 2). Twenty-four black morels were found in this area. The mushrooms ranged in size from one inch to five inches. All of the mushrooms were partially dried out, and were presumed to have emerged approximately one week before they were discovered. Moisture content of the soil seemed to be low, but the site was approximately 75 feet upslope of the creek, and the immediate microclimate was cool. 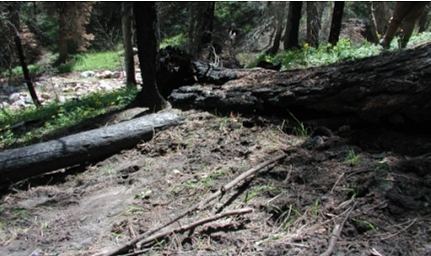 This area was revisited on June 26, 2003, and three black morels were found underneath the burnt aspen log. All were approximately one inch in size and were very dry. Another patch of morels was found east of Vallecito Reservoir, approximately 100 feet west of FR 603. The vegetation type was mixed conifer, on a 20 percent slope with a northwest aspect. Elevation was approximately 7,800 feet, and the intensity of the burn was moderate in this area. 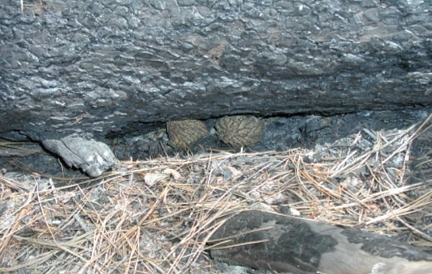 Five black morels were found growing underneath a fallen, burnt ponderosa pine log where a ground fire had occurred and the litter was removed (Figure 3). Morels in this area were approximately five inches in size. These morels were also somewhat dried out and had probably emerged a week prior to their discovery. On June 10, 2003, the area east of Freeman Park, which is located at the end of FR 809 (Ho Hum Drive), was surveyed (Figure 1). The area was characterized by a ridge-top mixed conifer forest interspersed with pure aspen stands, and the burn intensity was high. Elevation was approximately 8,400 feet. 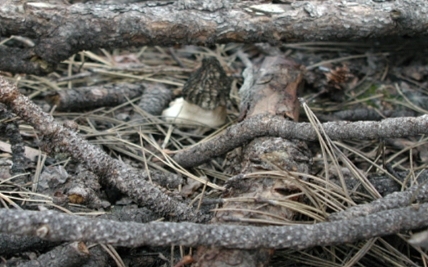 Two black morels were found growing in close proximity underneath burnt aspen and ponderosa pine logs (Figure 4). The overstory in the immediate area consisted of aspen and ponderosa pine, with a few scattered white fir. The slope was 5 percent and the aspect was slightly east. The morels were approximately 2 inches tall and had emerged within the past few days, as they were relatively moist. This area was revisited on June 26, 2003, and morels were not found. However, the slopes immediately southwest of Freeman Park were searched, and 34 black morels were found (Figure 5). Burn intensity in the area was low to moderate. Slopes were 30 percent with a north aspect, and spruce, fir, and aspen dominated the canopy. The morels were located at the bottom of the slope and adjacent to a drainage, where the microclimate was cool and moist. Elevation was approximately 8,500 feet. Most morels were very dry, but a small percentage of morels that were found near the drainage bottom were moist and had emerged recently. This area was revisited on August 5, 2003, and only one dried morel was found. The area immediately adjacent to Young’s Canyon Trail was thoroughly searched for morel mushrooms on June 11, 2003. The trail winds through spruce-fir forest interspersed with pure aspen stands for approximately 3 miles. Aspects range from south to east while slopes vary from 20 to 30 percent. Moderate to high burn intensity is found in most areas. Elevations range from 8,200 feet to 10,000 feet. Morels were not found in this area. The location seemed favorable, and morels may emerge at a later date due to the higher elevation. The area also seemed dry and more rainfall is probably necessary for production. 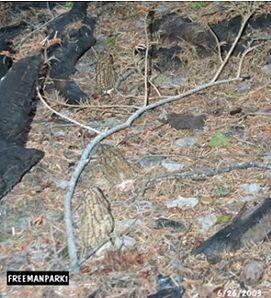 In the first week of September 2003, approximately two pounds of morels were found by a Forest Service timber crewmember while working in the Wallace Lake Area (Figure 1). Morels were located on northeast and northwest facing slopes, within an area dominated by spruce-fir and aspen. Elevation was approximately 9,500 feet. Frequent rainfall and moderate temperatures at this high elevation probably contributed to the late season occurrence of these mushrooms. Evidence of morel gathering by the public was not discovered within any of the search areas. Cuttings and/or removal of morels were not evident. Additionally, morel hunters were not encountered in the field. Morels were found in four of the nine search areas. Most of these areas were characterized by mixed conifer with aspen or spruce-fir-aspen vegetation types that had experienced low to moderate burn intensities. All of the morels within the mixed conifer were found near or underneath ponderosa pine or aspen logs that had fallen previous to the wildfire, and which then burned intensely enough to partially consume the logs and clear the ground of duff and litter. Morels in the spruce-fir-aspen were found in areas of low to moderate burn intensity underneath live white firs. All of the morels found were growing in the cooler microclimates within the forest. All of the mushrooms were found on northeast or northwest aspects, adjacent to drainages, and/or underneath logs. Morels that were underneath logs and in stump holes were the largest mushrooms that were found. Sixty-six morels were found within four separate search areas within the Missionary Ridge Fire burn area. Additionally, two pounds of morels were found outside of these initial search areas, but within the Missionary Ridge Fire burn area. Habitat consisted of two different types: mixed conifer and spruce-fir-aspen. The lower elevation, mixed conifer stands had experienced low to moderate burn intensities, and was situated on northeast to northwest facing slopes. Morels were found within the cooler, moist microclimate within this habitat type. Morels in the spruce-fir-aspen stands were found in similar areas, but were found in higher densities in this habitat type--probably because the area received more rainfall and/or retained a higher moisture level. Morels were found at increasing elevations throughout the summer. In early June, several morels were found from 7,800 to 8,400 feet; however, many were dried and had been emerged for at least a week prior to discovery. In late June, a larger quantity of morels, ranging from dry to very fresh, were found at 8,500 feet. In September, two pounds of fresh morels were found at 9,500 feet. This trend is probably influenced by increasing temperatures and rainfall throughout the elevation range as the summer progresses (Figure 6).